I recently recieved a Phalaenopsis Orchid plant for my birthday. This is my first orchid so I am really nervous about killing it. Your site has been pretty helpful so far but I was hoping you could give me a few pointers. It came in a well drained plastic pot with 4 flowers in bloom and 4 buds. I put the plastic pot insdie another pot that has a built in drain pan for humidity. I keep the plant in my office because I only have 1 small window in my apartment that gets direct sun light in the summer and virtually no light in the winter (I live in AK). I figured that my office would be the most stable environment for it. I do not have a window in my office but we have florescent lights on for 12 hours a day and on the weekends I put the plant on a coworkers desk for a little indirect sunlight. Here are some of my concerns........A few leaves are dark green (one's closer to top) and a few are turning yellow starting from the tip of leave down (one's closer to bottom). The leaves look like they have some sort of white residue on them, some more than others. 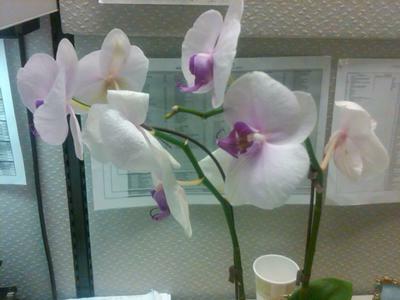 The flowers that were in bloom when I got the plant (June 1) are wilting but the other 4 look fine. 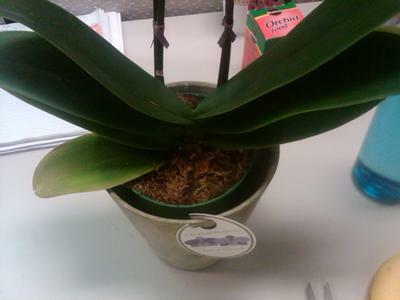 I water the plant about once every 2 weeks and use Orchid food every other watering. The instructions say to water wheh the moss is dry. Some of the roots on top have turned brown and dried up and some of the roots I can see through the bottom of pot are brown, soft and mushy. Any pointers you could give me I would greatly appreciate. Orchids need lots of natural light! Chances are the orchid is trying to tell you that it needs far more sunlight. I had mine a few feet from a sunny window and had to move it into practically full sun exposure and now its starting to do better. Truth be told those direction things that come with the orchid are full of it. Haha. Now I'm no orchid expert as mine is my first orchid but I would advise moving the orchid to somewhere that has way more sunlight. The watering and root part I can't help much with as I'm still trying to figure out watering myself. Google the orchid and start reading :) that's what I did. Hope I helped a bit.